The increasing popularity of User-Generated Content (UGC), such as wiki, blogs, photo- and video-sharing, and social network sites, has raised serious challenges to the principle of division of labor, which has been the corner stone of modern media industries for centuries. As millions of ordinary citizens are becoming independent producers of media content, will reporters, editors and other media professionals still be needed? Conversely, after the enthusiasm for novelty fads, will the division of labor prevail with professionals continuing production and amateurs returning to the role of consumers. Given the short history of UGC, these are open questions for close examination. The current study attempts to assess the sustainability of UGC by focusing on blogs, arguably the most popular genre of UGC. We have crawled 20,000 blog sites through a random sampling procedure from blog.sina.com, one of the largest blog service providers in the world. 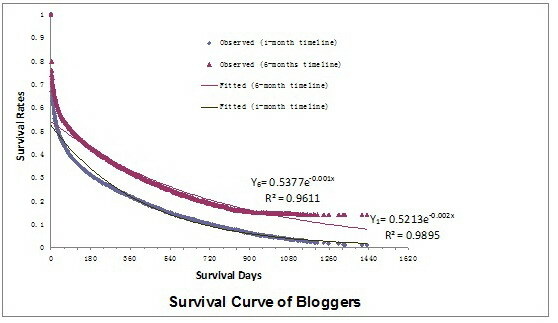 Using the date of last post by each author as the operational measure for sustainability of blogging behavior, we have found that the trajectory of blogging follows a standard exponentially decaying curve (i.e., authors are most likely to quit from blogging right after signing-up but become increasingly less likely to withdraw as time goes by). We have further tested the impact of blog content, author tenure, author lifestyle, audience feedback and other factors on blogging sustainability, to reveal individual and structural conditions that moderate the trajectory of sustainability. 1. Cumulative growth of sina bloggers shows a nearly linear trend. 2. Power law distribution of number of posts per blogger. 3. 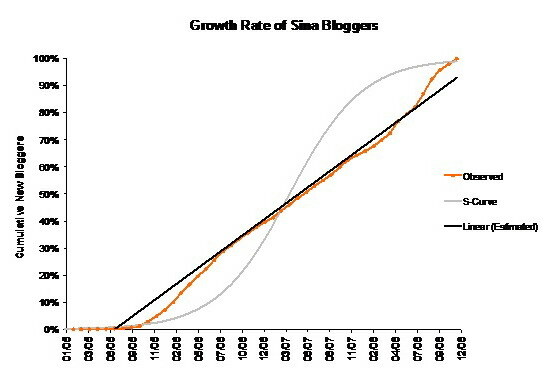 The survival curve of sina bloggers fit the exponential function well. 4. 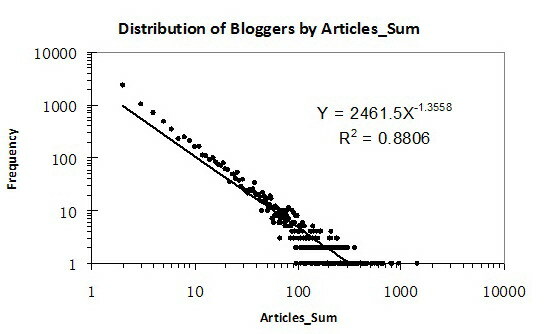 Exponential survival function of hazard rate (of discontinue one’s blogging).